A non-stop roller-coaster ride through the scariest moments of the greatest terror films of all time. I think it would be fun to be a part of the audience presented in Terror in the Aisles, and not just because Donald Pleasence and Nancy Allen are among the crowd. Though the extras (which include Joe Asparagus!) bringing the crowd to life are gleefully overacting, they’re doing everything a good audience for a horror flick should be doing: gasping, squirming, laughing, and generally having a good time. That’s what this compilation/documentary hybrid is most concerned with: why do audiences crave terror, and how has cinema provided it in spades over the years? It’s perhaps a bit scatterbrained while doing so, but the documentary strings together clips from horror films (mostly the usual suspects--The Omen, Alien, The Exorcist) as Allen and Pleasence provide some commentary. Occasionally, their musings center around a certain topic, such as the films of Hitchcock or memorably terrifying villains. While the commentary isn’t necessarily insightful (a lot of it is typical psychological platitudes--you know, audiences seek catharsis through being scared and what not), Pleasence is especially delightful; although he’s generally known for his ability to give anything an ominous quality, it’s clear he’s having a good time here. Terror in the Aisles is also a fun little horror clip show. I especially enjoyed some of the early montages that compile a bunch of repeated horror tropes: people slamming doors, answering phones, and the like. It’s actually quite amusing to see how many films utilize the same, familiar elements, and the rapidly edited mash-ups manage to capture the immediacy of their suspense even out of context. While it’s hardly exhaustive and tends to lean heavily towards monumental films, it’s a decent primer for casual fans or newcomers to the genre. If you’re expecting an excursion into obscure, sleazy, and violent fare in the vein of the Wizard Video compilations, you’ll be disappointed. Instead, its obscurity stretches to some underseen 40s movies and stuff like Frogs and Food of the Gods, while its most violent offering is the infamous exploding head from Scanners. In between, you’ll see everything from The Wolf Man to The Thing, with many of the selections tending to be stuff owned by Universal. However, this isn’t much of a compilation at all, really, but more of a half-hearted documentary that bounces around with reckless abandon. There’s no real through-line--one minute, Pleasence is discussing the merits of The Texas Chain Saw Massacre (and butchering the pronunciation of Ed Gein’s name) before moving on to a section on Hitchcock. To get an idea of how scattered the information is, one of the last segments takes us back to the beginning of horror films, particularly the Universal Monsters. Along the way, you’ll take some strange detours where the selections aren’t horror films at all; instead, action and drama fare like Midnight Express and Marathon Man are on display. Also, someone at Universal must have really wanted to move some copies of Nighthawks off of rental shelves, as the killer duo of Stallone and Billy Dee Williams are featured prominently. Even when Terror in the Aisles shifts back to horror, newbies won’t appreciate the lack of identification for these films; sure, veterans will know The Brood, The Fog, and Alone in the Dark when they see it, but I think the appeal of something like this is seeking out a flick that looks particularly cool. That’s hard to do when you don’t know what you’re looking at. It does stay entertaining enough, particularly when it makes some observations that are interesting in hindsight; for example, Allen muses on the role of sexuality in horror, particularly how the promiscuity is met with punishment. We’re all too familiar with that in the post-Scream landscape, but it’s neat to see that it was being picked up on just as the slasher craze was beginning to wear it out. Other chronological curiosities abound; for example, it’s difficult to imagine a definitive (not that this is very definitive anyway) horror documentary not featuring the likes of Freddy, Pinhead, or even Chucky, but this was before their time. 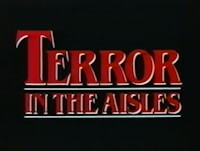 In this respect, Terror in the Aisles is mostly an interesting time capsule, even if it feels like it was hastily thrown together to capitalize on the 80s horror boom. For many years, it remained bound to VHS (which is where these screen caps come from), laserdisc, and TV airings (I actually saw it on Chiller a few years back), as it never made the digital leap (perhaps due to rights issues stemming from the numerous amount of clips). However, it recently snuck itself onto Blu-ray as a special feature on Universal’s Halloween II release, and it’s presented in HD to boot. Quite a nice surprise, as the widescreen transfer is fantastic, even if it does crop everything to 1.85. In fact, it’ll have you craving many of the titles that have yet made the leap to high definition (Jaws can’t get here soon enough). The audio is only a standard Dolby stereo track, but it’s more than adequate considering it’s a nice, unexpected bonus. Considering the low price tag, you’ll want to snag that release for your collection; for less than 15 bucks, you’re getting one of the better slasher sequels of all time*, plus this retro curiosity, which would only be worth streaming on Netflix on its own. Rent it! *Having glanced over the main feature, I can say that Halloween II looks and sounds quite good; however, purists might want to know that the opening credits have removed the “Moustapha Akkad presents” card and replaced it with “Universal/MCA presents.” I think the jury is still out as to whether this was an intentional slight by Universal, but it could be something that irks fans--fair warning.